"Yes, I actually attended the show at the Swing Auditorium and I have at least one memory that contradicts something noted. I am as certain as I can be that "Herman's Hermits" did not open the show. My memories of that hot day in San Bernardino is that there was a local band who played first. They might be the band that's noted as "Facelift". I remember they were playing sort of what I considered back then to be new wave. They may have had a girl singing, because this weird association stuck in my mind that they were trying to emulate the sound of Blondie. They were not well received and after a few songs a number of items were thrown at the band. (I have this image in my head of the guitarist using his Les Paul Gold top to swat away a shoe that was launched at him). I don't believe they did a full set, likely about four numbers, then they fled the stage. But, the next act was introduced as "Steppenwolf", they did a selection of Steppenwolf songs including "Magic carpet ride" and "Born to be wild". When they finished the lead singer (who I always thought was John Kay, but now have my doubts about) came out to introduce Deep Purple. 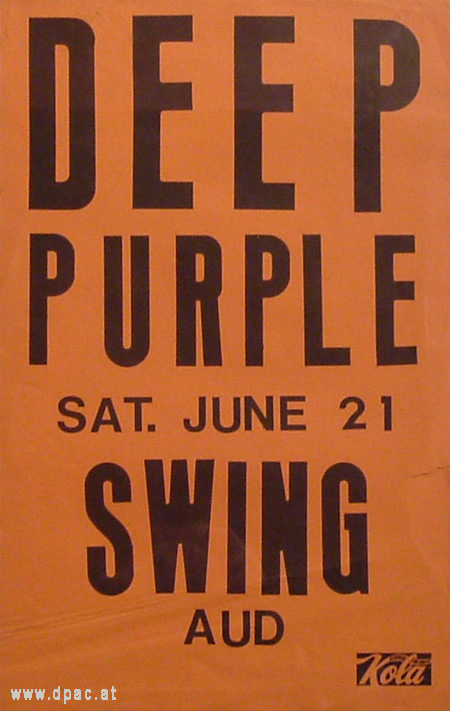 I noticed then that the same band came out to perform as Deep Purple (my final inkling something really wasn't right). I knew who Rod Evans was, but I remember being very let down that Blackmore, Lord, etc weren't there. I recall the performance was sloppy and my girlfriend and I realized we'd been totally scammed. If memory serves, we didn't even stay to the end, but left a little early to get out of the parking lot. But, I can say with full certainty that no one performed as Herman's Hermits at that show....it may have been a bogus or partial Steppenwolf, but it wasn't Herman's Hermits who, had they played would have gone down even worse with that crowd than the first band did. The Swing Auditorium (where the show was held) later burned down after a small plane crashed into it. That was the only show I ever saw there. But, I know at least one other bit of trivia about it. It was the site of the first Rolling Stones concert in America. KOLA was a rock station out in the Inland Empire (that's how Riverside and San Bernardino are referred to around here). Their signal didn't reach Orange County well (That's where I grew up, south of Los Angeles and near Disneyland). I never really listened to them back then, the dominant station from LA was KMET, and that's who we all listened to in the late 70's. So, I don't know if the show was broadcast, and I've never heard of any recordings. I hope that maybe helps to provide a little firsthand knowledge of one of the shows done by the bogus band in 1980." Many thanks to Jon Trask for this great new story and his support!